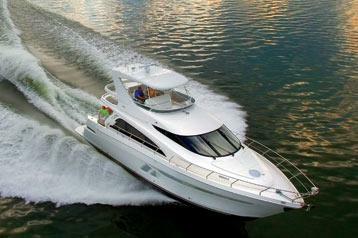 This yacht comfortably accommodates up to 30 passengers, making it ideal for business functions. When is the last time you had a blast at the annual company meeting? Take your colleagues out on the water, where they are shore to enjoy the party. The city skyline is breathtaking at sunset, and looks even better from sparkling Lake Michigan! This yacht is also perfect for larger families, or smaller families who crave space. Easily navigate Chicago’s waterways to take advantage of the available dockside dining options, entertainment and sweeping views. Whether sightseeing or snorkeling, this larger yacht has it all. Conveniently stocked with cold beverages, special requests can be accommodated. Get your free quote today and begin planning your special event onboard an exclusive private yacht charter!